These flutter sleeves — loose-fitting and cool — were popular in the 1970s. Butterick pattern 3578, dated to 1974. They are reminiscent of a Nineteen Thirties’ style. 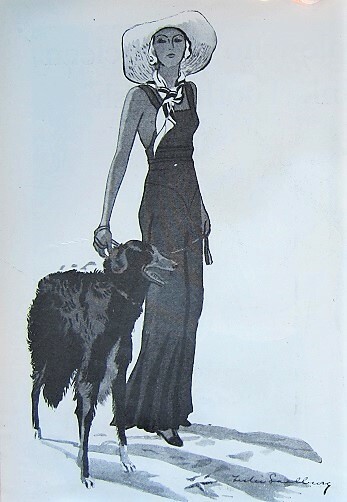 A variation on the cape, the bertha collar, and the sleeve, a pair of “capelets” covering an otherwise sleeveless dress became a fashion in 1930. But the “bertha” came first. This sheer frock with scalloped bertha collar (sometimes called a cape or capelet) was suitable for teens and for women up to size 44 bust. Delineator, Jan. 1930. This very similar dress calls its scalloped bertha collar a “capelet.” Butterick 3054; Delineator, February 1930. Butterick blouse 3758 has a bertha; Delineator, April 1931. Butterick 3231 has a bertha collar. Delineator, May 1930. Butterick 3587 (left ) and 3566 (right.) In both [otherwise sleeveless] dresses, the upper arm is covered by a “capelet.” Left: this “capelet” is a bertha collar. Right: Two separate capelets are the new style. The broad, sheer collar on the left is a bertha collar described as a capelet; the sleeves on the right, which suggest the “flutter sleeves” of the 1970s, are actually two little capes (or “capelets,”) one to cover each arm. See the back view. They don’t meet in the back, as a cape would. On Butterick 3252, right, the capelets are outlined in rickrack trim. Delineator, June 1930. The “bertha” collar (which had been popular in the late 1830s to 1840s) was familiar again in the 1920s, often appearing on evening dresses for girls in their teens. Left, an evening dress with a cape-like bertha collar. Fashions for teens, September 1926. Delineator. The arm baring dress on the right is more adult. Dressy dresses for girls in the Twenties often had a bertha collar, which covered the upper arm. Delineator, April 1930. The bertha on the right is split in the back. Butterick 2070 from June, 1928. Delineator. The attached bertha collar ties like a cape. 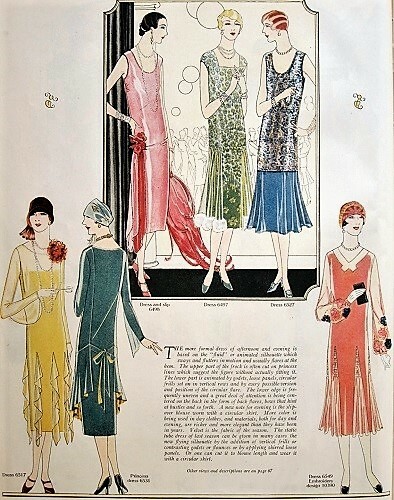 Of the six 1930 dresses that were originally featured on this page, four of them have some kind of cape-like sleeve or bertha. Four (and a half) dresses from page 34, Delineator, April 1930. The bertha resembles a cape when viewed from the back of the dress. This sheer, attached collar covers bare arms. Butterick 3168; Delineator, April 1930, p. 34. It’s an afternoon dress. Older women probably appreciated the upper arm coverage, but were used to going bare-armed in very formal evening gowns. This very-wide collar extends past the shoulders, but it’s not long enough to be described as a bertha. 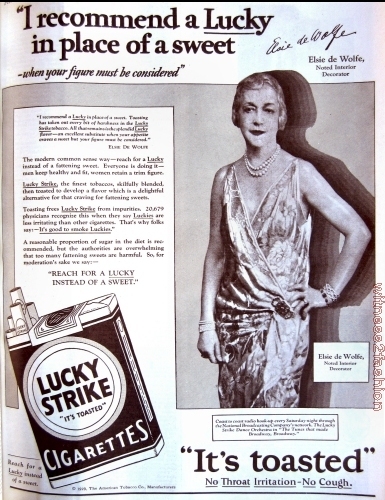 Butterick 3140; Delineator, April 1930, p. 34. 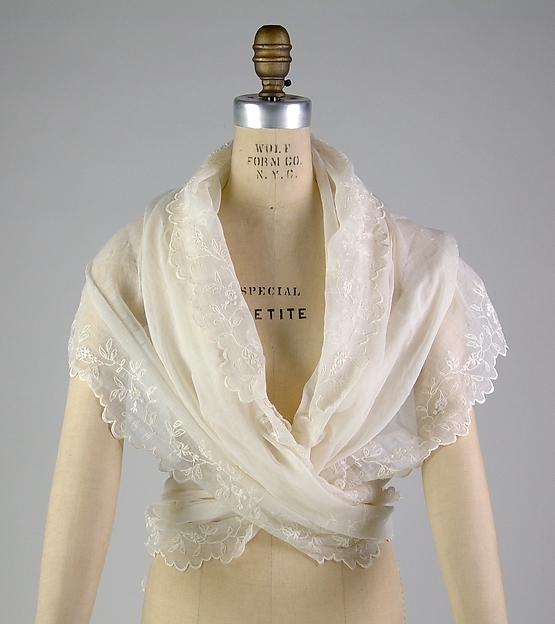 There are optional 3/4 sleeves under this extended, ruffled bertha collar/capelet. Butterick 3138; Delineator, April 1930, p. 34. Where does the cape begin? Where does the collar end? Butterick wrap dress 3145, Delineator, April 1930, p. 34. Click here to see a fichu. “The Cape Idea:” three variations from Delineator, May, 1930, p. 32. Right, 3221 has double-layered capelet sleeves — a little two-tiered cape over each arm. Butterick blouse 3274, from June 1930, shows its capelets — probably each is a half-section of a circle. They are not sleeves, because they do not have an underarm seam. A pair of capelets had to be stitched to the dress, but bertha-like capes/capelets could also be removable — some patterns gave the option of making a separate cape or one that was attached like a bertha. The cape at left is part of the dress (and is actually two pieces in back;) the cape at right could be made separately. Butterick 3190 and 3237. Delineator, May 1930, p. 108. Left: Butterick 3277 could be made as a sleeveless dress with separate tie-on cape, or as a dress with a bertha/capelet attached under its little white collar. Delineator, June 1930. Right: Oh, no — another 1930’s bolero! Below, a little “capelet” is sewn to the dress over each armhole. Butterick dress 3293, Delineator, June 1930. The Commercial Pattern Archive has this pattern. The pattern layout shows that each capelet is about 1/3 of a circle, curved at the top. The back view of Butterick 3334 clearly shows long capelets rather than closed sleeves. The front also shows a glimpse of arm between the capelet and the dress. The sleeves on the right do look like sleeves, rather than capelets, but they are described as “shoulder capelets.” Butterick 3486, October 1930. Pretty sleeves — not capelets — from May 1930. Butterick 3202. I believe that actual capelet non-sleeves went out of fashion as 1930’s sleeves grew puffier and shoulders grew wider. This 1939 dress has padded shoulders; instead of a flared, semi-circular capelet or sleeve, this sleeve has a pleat for fullness. Butterick 8583 Butterick Fashion News, Sept. 1939. A lovely style while it lasted…. Two 1930 dresses with capelet sleeves (left) or a bertha (right) to cover the upper arm. Butterick afternoon dresses 3247 and 2988. The dress at left, above, had three capelets: one over each arm and a third covering the gap between them in back.